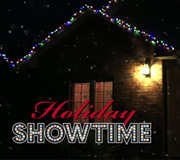 Introducing the newest and most innovative product is Holiday ShowTime brand of products. Holiday Showtime has a vast offering of Holiday products. Decorating your home or office with Holiday Showtime will bring a Holiday show you soon will not forget. The Holiday Showtime lights are indoor/outdoor capable and synchronize 14 different light functions that can connect up to 1400 lights. The light functions include slow drip effect, random twinkle, cascade, and chasing to name a few. These lights are available in a variety of colors, bulb sizes and shapes. The LED lights offer an 80% savings over traditional incandescent lights. These new lights offer customers a variety of unique light functions to change the look of your lights without the difficulty of adding and removing the light strings. Multiple looks throughout the holidays at an affordable price. Pathway markers bright white LED lights to light your driveway, garden, walkway, sidewalk steps and more! These Pathway markers are no ordinary lights. These are equipped with computer chip boards that will give your pathway a truly random pattern of lights to create envy throughout the neighborhood. Why decorate with ordinary pathway markers, when you can decorate with Holiday Showtime markers. The assortment of Indoor pre-lit trees with advanced features and technology. The music dancing tree syncs music and lights together, to bring a wonderful show to your home. Simply connect your iPod or music device to the tree control box and watch the lights react to music. We offer color changing trees that changes from clear to multi lights. We offer multi function lighted trees to change the light patterns on your tree at anytime. These trees all come with LED lights for 80% energy savings over traditional lights. Depending on your mood, you can change the light color or the light function with a simple turn of the switch. Are you tired of working with hard to reach places to change your light or tree features to turn them on and off? Purchase The Holiday Showtime remote control or cell phone application to adjust features on the Holiday Showtime brand of products. All Holiday Showtime products will add fun and excitement to holiday decorating. You will love our Holiday ShowTime lights and trees. ShowTime for the holiday! Copyright © 2012 Willis Electric All Rights Reserved.